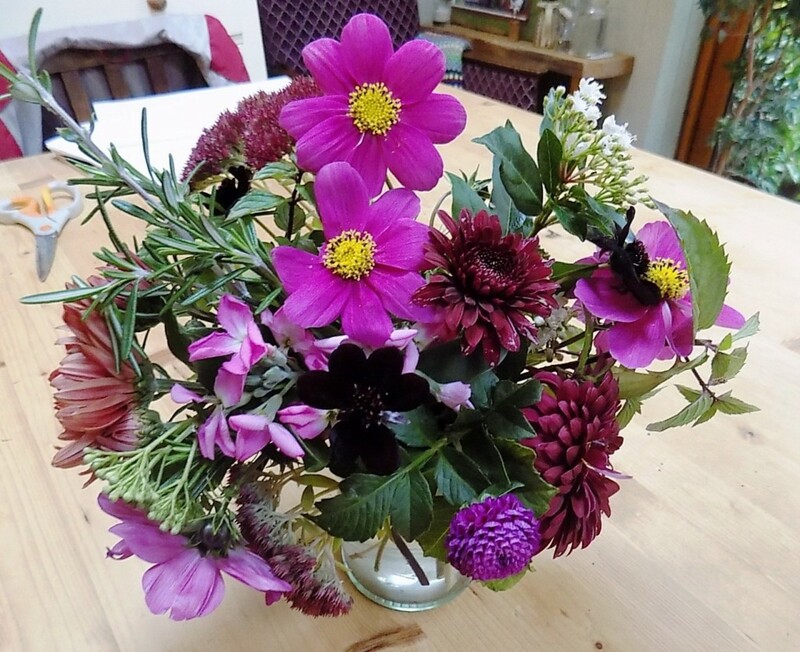 Winter is approaching - we've had the first frosts which have blackened the Dahlia foliage and killed off the half-hardy Zinnias. 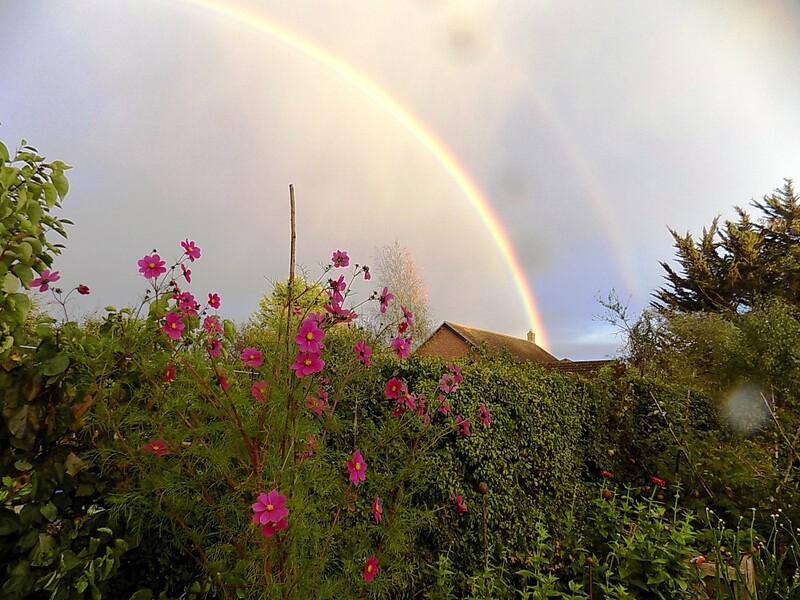 My Cosmos seem to have escaped this fate owing to their height (over 6 ft this year!) and are still in full flower. Once dahlias have been blackened by frost, it's time to cut them down and either dig them up for storage inside over the winter or to apply a thick mulch to protect them. 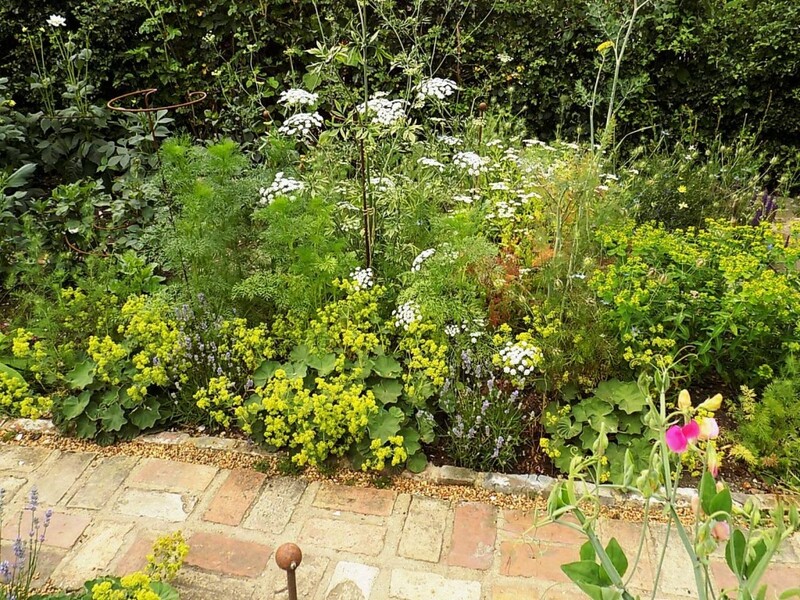 Annuals which have given up the ghost should be removed and composted and empty beds given a covering of organic matter - compost or manure. It can be left on the soil surface for the worms to drag down and enrich the soil over the winter. Where I have planted out biennials, I just mulch around them. Cosmos, '10 Week' Stocks, Chrysanthemums, Rosemary & Sedum in a jam-jar arrangement made by a student attending a workshop in November. As an avid watcher of predicted overnight temperatures, I dug up my frost-tender Chrysanthemums before any danger of frost. Late-flowering Chrysanthemums like the elegant 'Avignon Pink' don't start flowering until the end of October and will flower up until Christmas. You can either grow them in pots which can be brought in under cover or plant out over the summer and then carefully dig them up with an intact root ball and place them in large pots in a greenhouse/conservatory or potting shed. 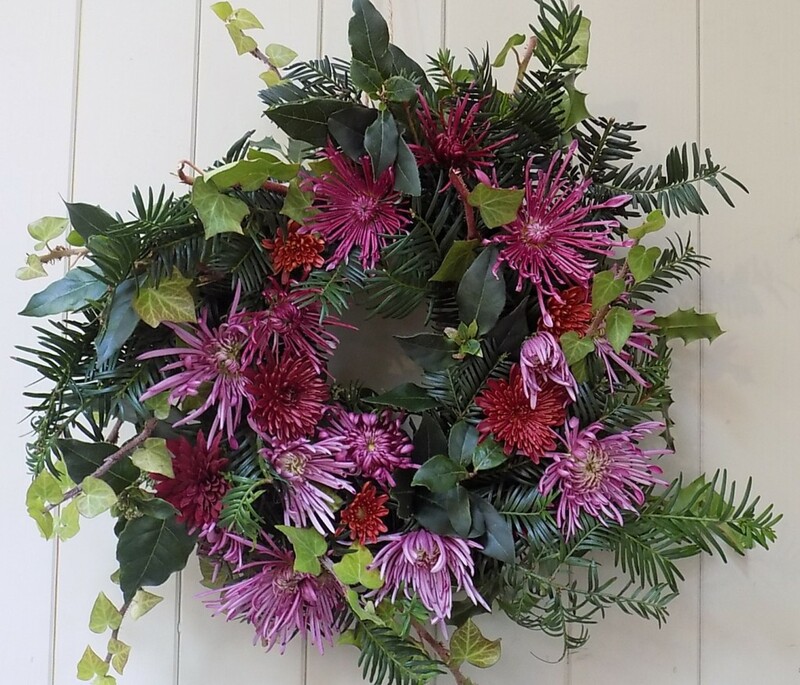 I find them really useful additions to fresh Christmas wreaths as they are very long-lasting flowers once cut. 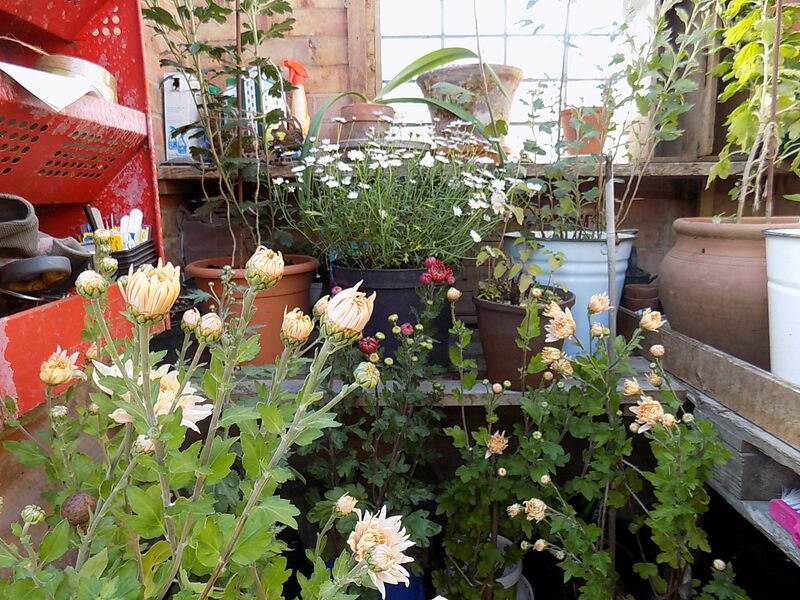 Chrysanthemums snug and warm in my tiny potting shed. I sowed some hardy '10 week' Stocks and Chinese Forget-me-nots late in June and these are still full of flower, so along with some Borage and Feverfew still in flower, a suprisingly summery jug of flowers can be picked even in November. 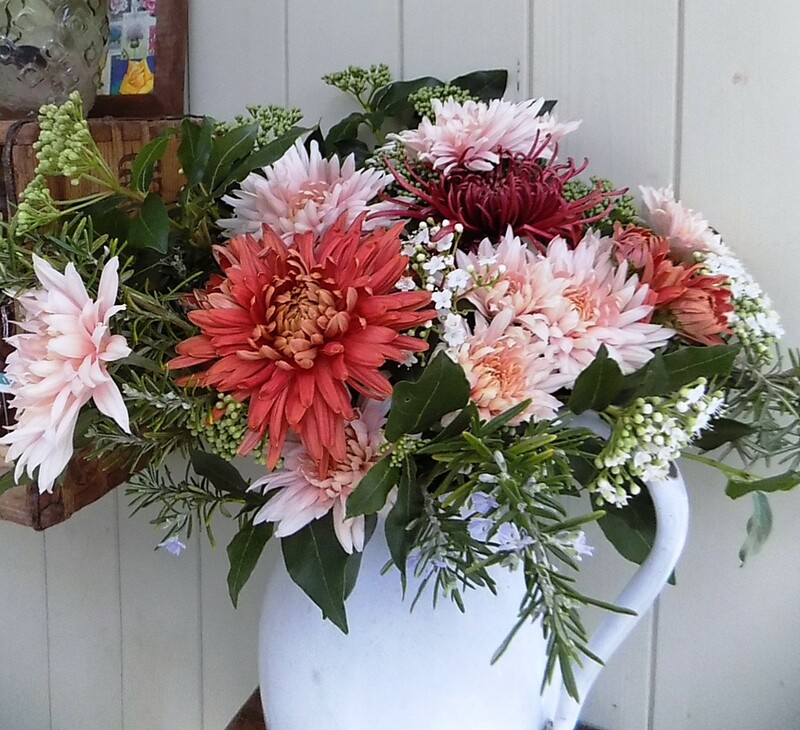 Chrysanthemums 'Avignon Pink', 'Tarantula Red' and 'Pandion Bronze' with Rosemary and Viburnum tinus. Viburnum tinus is a shrub that is overlooked for a lot of the year but come October/November it is flooded in fragrant white flowers. These are invaluable just when the herbs that I use for foliage/filler material in a vase (like Borage, Mint and Feverfew) are coming to an end. The baton is handed to this evergreen shrub for most of my winter flower displays and trimmings look good in a fresh Christmas wreath. 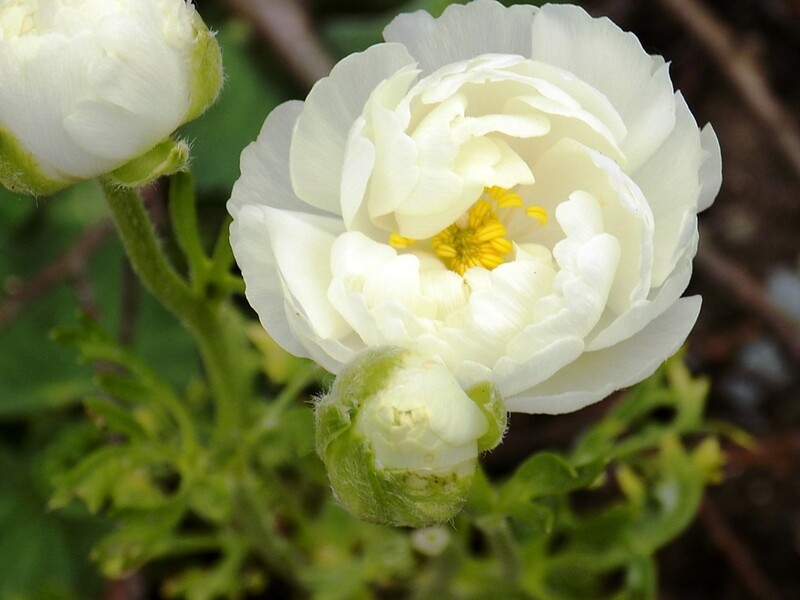 I have to admit that I'm a bit of an impatient gardener and, early in the season, tend to be found out in the garden coaxing (ok, maybe threatening) flower buds in the hope they will open just a little earlier as I can't wait for the annuals to start flowering. 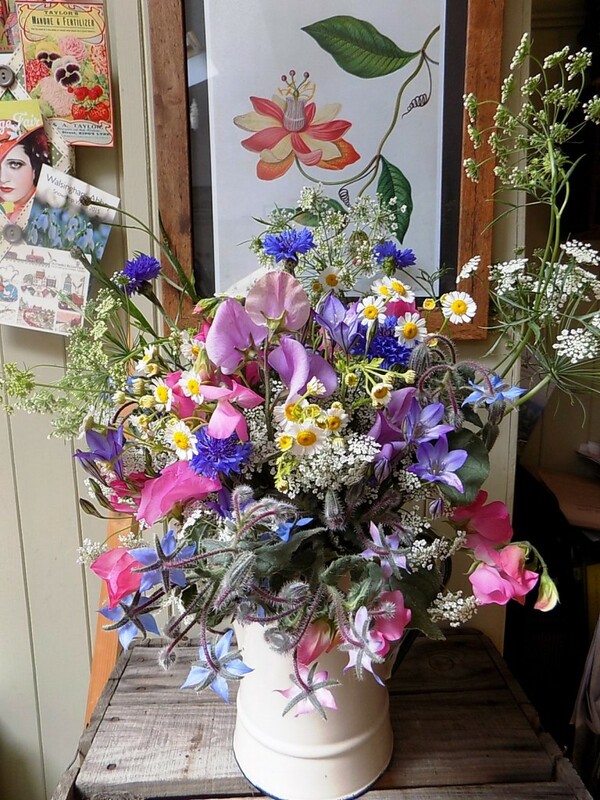 Come early Summer, however, when the cutting garden is in full swing, there is so much to pick that I often wish things would slow down a bit. 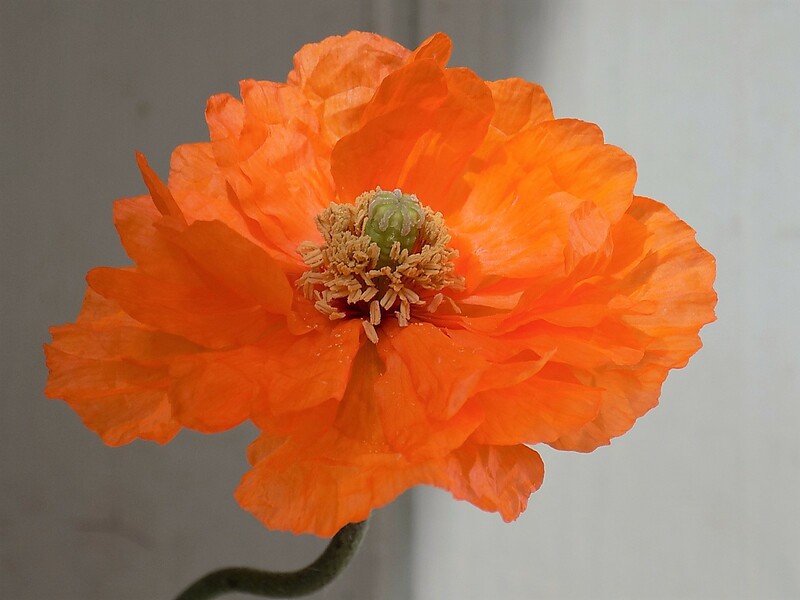 If I were running a cut flower business, then I would be cutting most blooms before they are fully out, just breaking from the bud, to prolong their cut flower life. 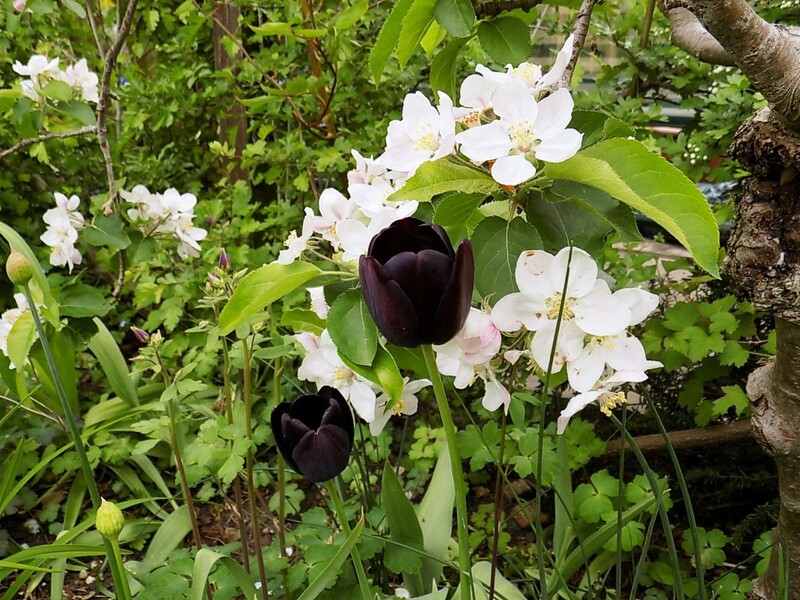 A true cutting garden would be rather devoid of actual flowers out in full bloom. As I pick just for the house, I can afford to let some flowers bloom and be left for the enjoyment of all the bees, butterflies, hoverflies and other insects that come to feed on the pollen and nectar. As the cutting garden is near the house, you also want it to actually look good in addition to being a 'cut and come again' bed for cutting. As long annuals are dead-headed they will keep flowering for you for 2-3 months so I pick every day or so throughout the summer months. I cut the flowers, straight into jugs of water, in the evening when it is cooler. First thing in the morning is best, but I am busy wrestling my youngest into her school uniform at that time so I leave it until the evening when life is more relaxed. I cut them, trim the lower leaves and leave them in tepid water up to their necks overnight, before arranging them (informally) the next day. I grow a range of annuals and perennials in the cutting beds so that I have a mix of foliage, 'filler' flowers (small flowers that create a backdrop for showier blooms) and larger, statement flowers like Roses and Dahlias. 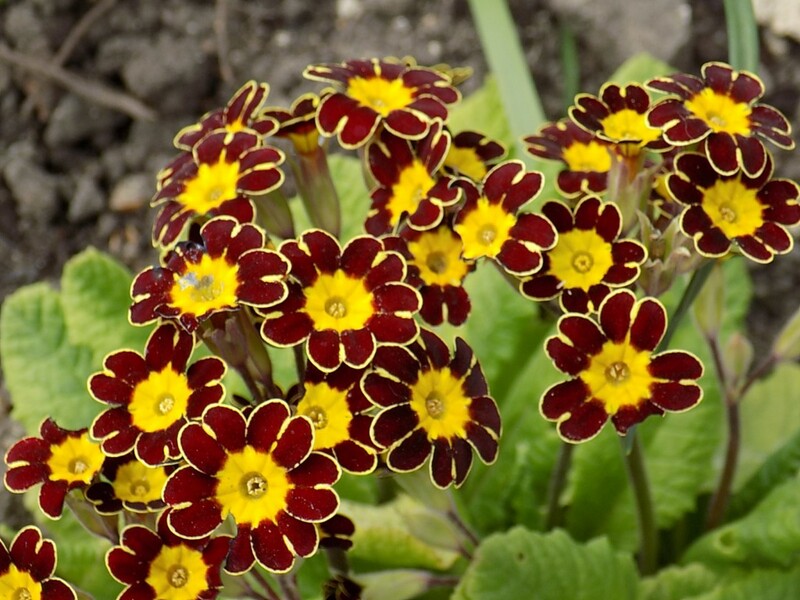 I vary the annuals that I grow from year to year as there is always a new variety to try or something I am intrigued by when looking through the seed catalogues in the winter months. 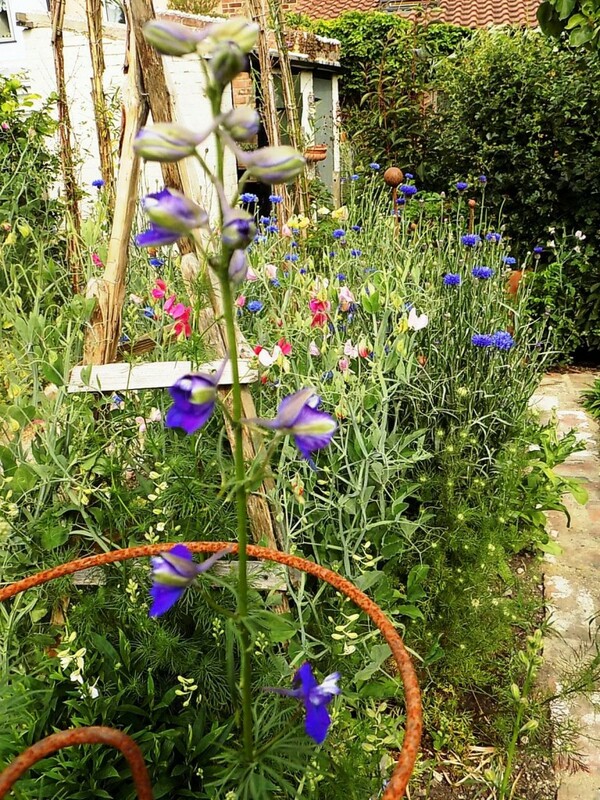 I always grow Sweetpeas, Cornflowers, Ammi, Scabious, Larkspur, Cosmos and Zinnias in some form. This year I'm also growing Calendula 'Snow Princess' (a pale yellow form of Marigold) and some white Antirrhinums (snapdragons). 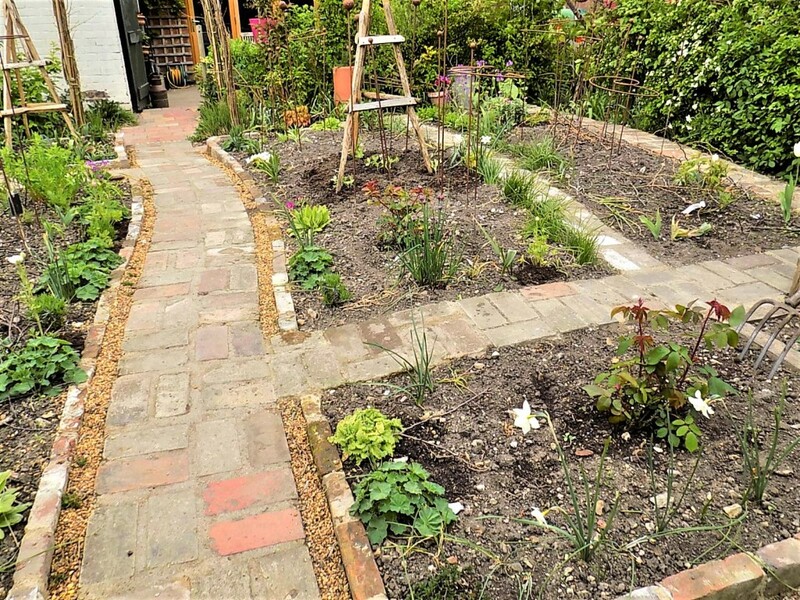 The other cutting beds house Lavender, Roses, Dahlias and a few perennials such as Guara, Achillea, Salvia, Coreopsis, Alchemilla mollis, Thrift and Oregano. 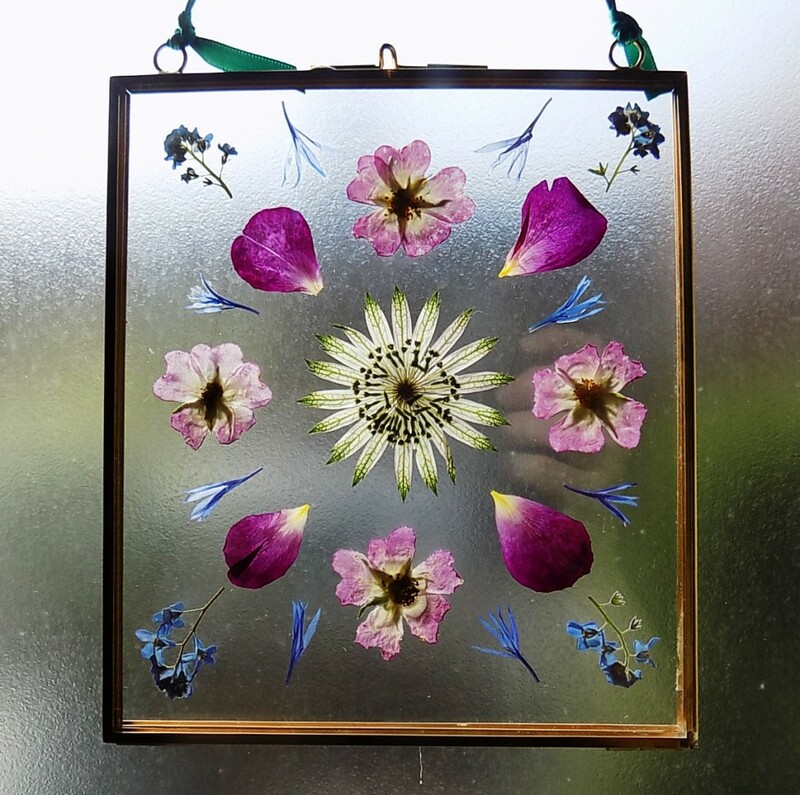 I am also growing some 'everlasting' flowers (flowers that dry to a papery feel and keep their colour and shape well) as I want to experiment with making some dried floral wreaths for indoor display. Will these will eventually for sale in my Etsy shop alongside my pressed flower pictures. 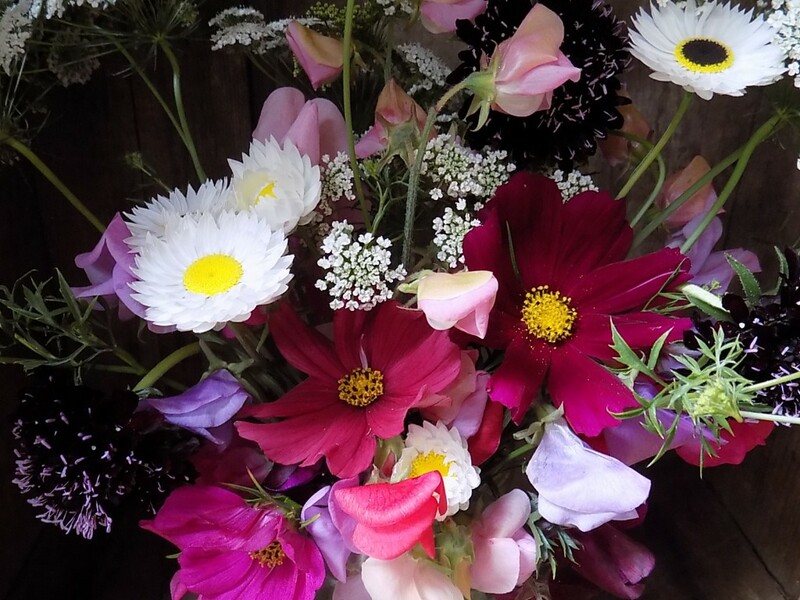 I've gone for Helichrysum bracteum 'Scarlet', a lovely deep red colour, Helipterum roseum 'Pierrot', white with dark centres and Acroclinum 'Double Giant Flowered Mix'which come in white and pink forms with a yellow centre (used fresh here with Cosmos, Ammi, Sweetpeas and Scabious). Acroclinum and Helipterum everlasting flowers can be used fresh or dried in displays.